When I was a kid I used to tote my lunch to school in the same old boring lunch box. It was the perfect companion to the same old boring lunch tucked inside (sorry mum!). So I try to be a bit more creative with the lunches I make for my first-born now he’s started school. We do bagels, lavash, sour dough, Turkish bread and rye with all sorts of fancy fillings. Of course, everyone knows a fancy lunch deserves a fancy lunch box. Feast your eyes on these cute-as-can-be lunch boxes from UK-based BirdyHome. 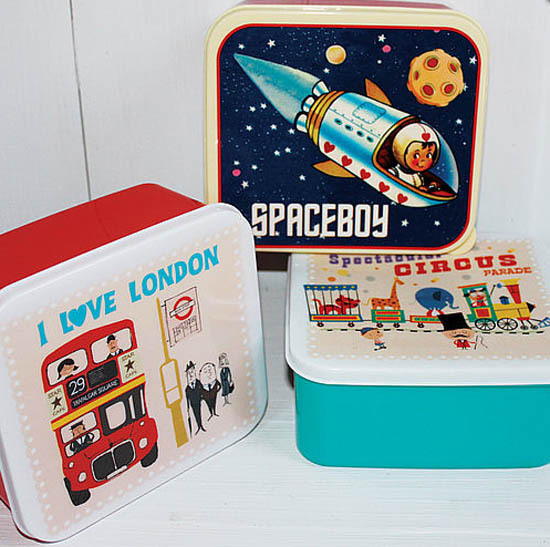 I know I’m drooling over the retro designs, which come in circus, spaceboy or London bus themes. Perhaps they may even have made my semi-stale Vegemite sandwich on white taste good! Not just for super-cool lunches, I like the idea of using these boxes to store special little trinkets and treasures for little boys too. Lunch boxes cost £7 each but you’ll need to find a friend in the UK or Europe if you want to order one because BirdyHome do not deliver to Australia.